Happy Birthday to FIMBY! 6 years old today! Happy Birthday to us! Happy Birthday to us! Happy Birthday dear FIIIIIIMMMMBBYYYYYYY! (all together now . . .) Happy Birthday to us! Yes its true! Six years ago, on 08-08-08 (very auspicious date) Juliet and I registered the business name FIMBY, and started working with our first 3 lots of guinea pig gardeners. And just like a seed planted in a well loved garden, FIMBY has germinated, put down roots, grown, changed form, flourished, borne fruit, been pruned . . . OK the metaphor is running out now. Its been a journey full of delight, learning, shared passion and dirty fingernails. Ahhhh, bliss! What a blessing to have worked with all the wonderful people in the extended FIMBY tribe over the years: co-founder and heartstrong woman Juliet, staff Danny, Hazel, Claire, Ben, casual workers too many to mention (but special thanks to current crew Michael and Jorgen), all our collaborators, suppliers, family and of course our customer/friends. Many customers become friends. That metamorphosis from client to co-conspirator is one of my favorite things about FIMBY. To celebrate our birthday I planted some peas today, dug out some volunteer potato babies that are cooking for dinner, plundered the last of the leeks and red cabbage (also cooking for dinner) and spent some time communing with the chooks and rabbits. So what about the traditional birthday 'give presents to everyone else' thing? 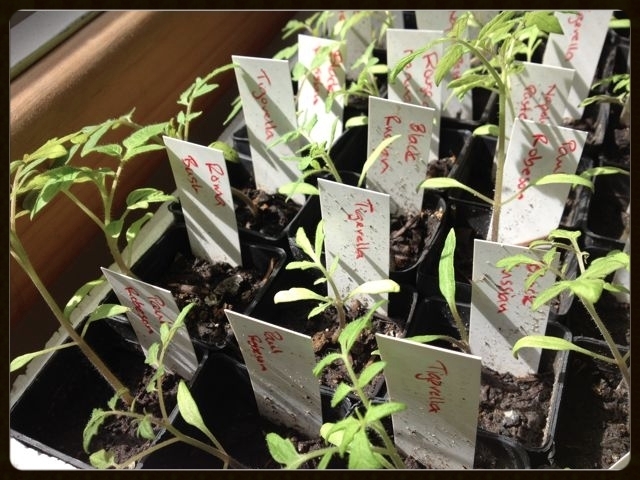 Well, we planted alot of tomato seeds last Saturday, so I'll give away a few packs of half a dozen tomato seedlings of your choice, in late October, for the first three readers to wish us happy birthday! Its been a pleasure to get to know Jennifer and her gorgeous garden over the last month or two of consultations and scheming together. Jennifer and Brad moved to town from Mountain River late last year, and Jennifer has been nurturing and bringing to full vitality a magnificent ornamental garden with views to die for out over the Derwent. Her main strategy so far seems to be: clear out overgrown stuff, cut things back hard, and feed the soil with lots of poo and crusher dust. Whatever she is doing its working - in just a short time I've seen the garden become so vibrant its just about humming! 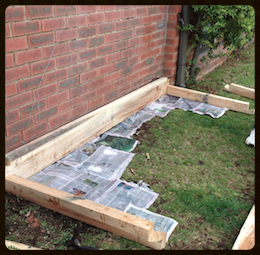 Earlier this week we installed a small Dovetail Timber garden bed in a sunny spot for stage one of our food gardening plans. We started by simply laying wet newspapers on the ground to exclude light from the grass, which will then contribute nutrients as it decays and is transformed by the soil biota. Soaking the newspaper in a wheelbarrow first stops it blowing around. The light rain helped too! We tucked the newspaper under the edges to stop weeds invading. Next we filled the bed with a 'raised bed mix' from Males Sand, the closest supplier that we have developed a special FIMBY blend with. 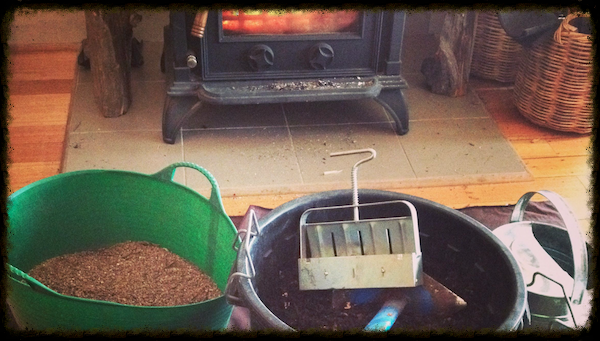 We sprinkled pulverised sheep poo and a bit of crusher dust between the layers of soil as we went. Access was great, a short wheelbarrow trip from the back of the ute to the bed. Very handy, especially as our combined ages are pretty likely to be over 100 years. Girl power rules! A bit of infrastructure by way of some bamboo teepees and a stepping 'stone' made from a sleeper offcut, and we were ready to plant. 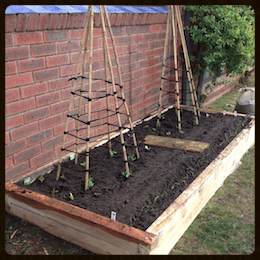 We chose a simple planting plan for a small bed: sugarsnap peas, some radish and beetroot seeds, lettuce and spring onion seedlings. We made sure the spring onions were not right next to the peas, as the allium (onion) family can inhibit the growth of legumes. Not a bad effort for about an hour and a half! Applause, applause! And then Jennifer went and corrupted me with an excellent coffee (thanks Brad) and a taste of the most divine walnut and chocolate slice from Jackman and McCross bakery. Oh My. Competition for favorite client status is hotting up! 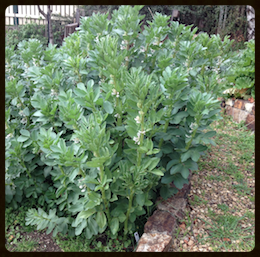 My broad beans are quite tall for the season this year . . . must be this warm winter. And I reckon they've grown a heap since the rain last week. Don't panic if yours are small, or not even planted yet. They can be planted now, and will catch up to Autumn planted ones remarkably fast as Spring progresses. Usually there is only a few weeks difference in flowering time between early and later planted broadies. But mine are flowering strongly already, so we'll see if I get some early ones this year. It was time to 'set some boundaries' today for these rampant plants that can bully other vegies and lean out over pathways as they get larger. 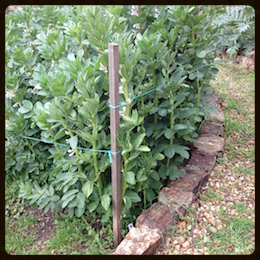 A very simple way to do it is to bang in a few stakes around the perimeter of the broad bean block, and then run some baling twine or strong string to keep them coralled. More lines of string can be added as they grow if necessary. There are a few other funky ways to keep them organised, including using recycled stuff. How do you keep them from lounging around? Send in pics if you have any nifty ideas! 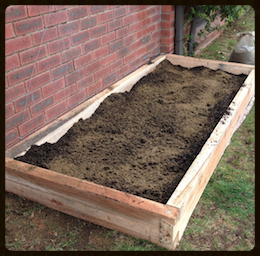 Soil blocking report - yum! A happy group gathered last Saturday to swap tomato seeds and try out soil blocking as a propagation technique. Since the weather was a bit dodgy, we set up inside so that we weren't distracted. And so the seeds didn't blow away. Ok Ok, mostly so that we were comfortable. There are advantages in not having any carpet in the house! The group was the usual lovely mix of new faces and familiar fimbaristas, and the garden talk flowed as we got on with mixing sand, worm castings and coconut fibre. Then people had a chance to try out using the hand held "blocker" which makes four 2-inch blocks at a time. James and Fin were particularly interested in the process and the mix, since a few days after this session they were planning to do 10,000 mini blocks for a new urban market garden venture! Yes, TEN THOUSAND! They will use a larger blocker that does about 20 per go, and the mini blocks are less than an inch square. But still, that will be an EPIC session. Anyway, with our modest aparatus people soon had some trays of blocks pressed out, complete with a dimple in the surface ready to plant. Then the seed packets came out. What fun! Descriptions of voluptuous Italian beauties smuggled into the country (known only as "Richard's Italian") (we're talking tomatoes here, don't forget). Delight in the last remaining sample of a hard to find variety with incredible flowering trusses and THE BEST taste (Paul Robeson). As James said, most people have quite polarised views on tomato varietites: there are the awesome ones, and the rubbish ones. Everyone was very polite, and didn't rush in. But there was also a kind of tension as we counted out small quantities of some of the highly desirable ones! We'll all be saving seed of some of these next year for sure. 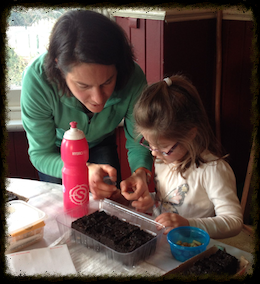 Yvette and daughter Steph were in on the action, making collections of yellow varieties as well as 'big red' ones. Yvette and husband Stew were one of our first clients, so nice to see the continued enthusiasm after six years. We also had a bit of fun in the kitchen. Yvette had brought along some of her delicious and healthy home made chocolate blocks. They looked disturbingly like soil blocks! Fortunately nobody put tomato seeds in the chocolate, or a soil block in their mouth. Would you be interested in a FIMBY calendar if I made one? We're thinking of getting one ready by Christmas time. It would be a month by month calendar with gardening notes, planting guides, recipes etc - as much as we can fit in the format that works. We'll probably make it a perpetual calendar, so that it can be used year after year (and can still be useful if they're not all distributed by January 2015). We're just in the planning stages now, and it would be really helpful to know if people might be interested to buy one or two, if they were around $5 or even $10 each. They will be beautiful - with lush FIMBY photos and design input from local talent Andy Townsend. The more we print, the cheaper they are . . . but we also don't want boxes of them lying around for ages. So, any feedback, enthusiasms or warnings welcome! Susan, a long term Fimbarista, is doing a bit of a clean out. 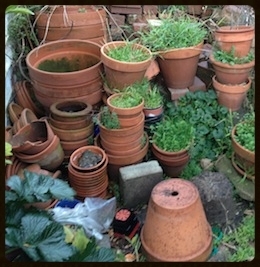 She has dozens of terracotta pots that she would love to pass on to someone for a modest sum, so that they are given a new lease of life. If you're interested, let me know and I can pass on Susan's details so you can make her a reasonable offer. They'd make great herb pots sitting on a tray on the kitchen windowsill. With an occasional holiday outside to refresh.